During our last year at Swansea University, Gareth and I studied the history of sport in British society 1860-1960. The course offered a wealth of stories from the establishment of the FA, to the emergence of the World Cup and the role sports like football had on the wider social structure of the country. One of these stories was that of Preston North End in 1888-9, and their miraculous unbeaten run in the newly formed Football League. The Football History Boys have looked at the twentieth-century, decade-by-decade, but never fully explored the earlier days of the sport and why they are so relevant to today. Yes, Preston went a season without losing a match, but the deeper story within this achievement is of immense intrigue. The Victorian revival of sport, known as the 'sporting revolution', gave birth to a number of games we follow and read about today. Football, rugby, tennis and cycling were just a small number of the sports which appeared between 1860 and 1901. Football, had seen its origins prior to this date in the mould of folk-football (known in Wales as Cnappan) which dates back to medieval Europe, reaching a peak in Tudor England. The Football Association's founding in 1863 by a number of English public schools began a codification of the sport, resulting in the game pretty much the same as on our television screens in 2014. J.A. Mangan cites that public-school life before the sporting revolution was frequently unchristian and ungentlemanly. Sport was seen as a way of bringing these ideals of gentlemanliness and Christianity back to the forefront of society. Before fully exploring Preston's remarkable feat, it is useful to gather an understanding of what football was like before the Football League's establishment in 1888. Sport itself was one dominated by class and class divides. The original public school representation of football was one which was short-lived. The first international match between England and Scotland in 1872 was played predominantly by upper middle class players sporting unconventional costumes much to the delight of the crowd. As football grew into the 1880s the sport began to be played predominately by working class players, who towards the end of the century had seen and increase in general leisure time. Following the popularity and early success of football through the international exhibitions and the FA Cup (formed 1871) the sport saw a rapid rise in spectatorism. The crowd which football attracted were generally mixed in class, but the vast majority were from the working demographic. Within the stands most classes were kept apart, especially in a time of political and social change outside of the game. A rise in audience figures meant a growth in revenue for many clubs and new money for the aspiring middle classes to spend on their respective teams and players. It was the payment towards players and the promise of jobs they gave which was the start of professionalism in football. Professionalism in sport was not a necessarily new invention. Indeed cricket had seen paid players before 1850 and boxing had seen a fair amount of gambling. By 1860, the moral ethos of the sporting revolution had brought a response, amateurism. This is essentially playing for the love and for the good of the sport in question. Football's decline into the 'disease' of professionalism was a threat to polite Victorian society and class divides. Through being paid to play the middle classes feared they may indeed lose their grip on the social structure of Britain. "They would like to see football universally pursued as a healthy recreation which tends to elevate the moral as well as to strengthen the physical qualities of the players. Their greatest fear for the football of the future is lest it should degenerate into a mere business...They feel anxiety, not unwarranted by the history of the last decade, lest the love of the sport should give place to the love of lucre, lest the vice of 'professionalism' should spread still farther its already corroding influence and the amateur should in the end be elbowed out." The extract from The County Gentleman is clear, those of superior social standing feared sport was losing its way. The FA Cup became the battleground for the conflicting sporting ideologies. Before 1883 the tournament had been won by only public schools and universities like The Wanderers and Oxford. It was in 1882, that Blackburn Rovers reached the final at the Kennington Oval, only to lose to Old Etonians 1-0, before Blackburn Olympic defeated the public school 2-1 the following season. Rovers and Olympic had produced players from a predominately working class background and stopped the upper class footballing dominance of over ten years. How was this possible? It is here that we come to Preston North End. In 1884, 5 years before the unbeaten season, the club was investigated for professionalism, a practice illegal under FA rules at the time. In a fourth round FA Cup tie against amateurs Upton Park, the London club accused their northern counterparts of including professionals in their line-up. Furthermore, the inclusion of highly paid Scots, also caused reason for grievance. Matthew Taylor writes that Preston secretary Major William Sudell admitted to it, but denied that the practice was wrong or unusual. Preston continued to note that a great deal more clubs were paying players to play, and that North End were not the only team to field such a side. "Evidence sufficiently convincing has been forthcoming to warrant the committee disqualifying the Preston North End...The real reason for the expulsion of the North Enders is we are informed is not in consequence of their having employed 'paid players', but because employment has been found for a number of Scottish men at salaries twice or three times as high as what they were earning at home...The committee might just as well have struck the whole of the Lancashire clubs out without more ado, as there is not one of those left in but what has thus sinned in the past if not the present." The Lancashire club were banned from FA competition for the next year, as were other professional teams. It took a year of proposals and ideas from the FA before the pressure from clubs like Preston became too strong, and professionalism became legalized. Amateur teams were disillusioned by the allowance of such a disease within the game, resenting 'those lower ranks of life' which had brought the morality of the game into question. For these sides, the working man was already physically more athletic, and payment towards him would only increase his talent further, making competition between amateurs and professionals obsolete. Following such disdain and discord between the two ideologies, the professional sides would breakaway in 1888 to form The Football League. This left clubs like The Wanderers, Old Etonians and Royal Engineers heavily reliant on the FA Cup. There is a great deal more that can be written about the amateur/professional divide and Preston's involvement, and it is this background detail which is so important to the wider success of the club. Nevertheless it is the story of their unbeaten league and cup double in 1888-9 which is what they shall be remembered for. As FourFourTwo put it - "Football's first invincibles." The unbeaten season is staggering, from 27 games played, the club won 23. In doing so they scored 85 goals, over 3 a game. John Goodall, Fred Dewhurst and Scottish pair Jimmy Ross and Jack Gordon composed a lethal forward line, scoring 67 times. The Pall Mall Gazette wrote that the final game of the season attracted 27,000 people, what they believed a record attendance at the time. 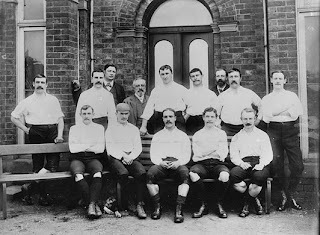 The newspaper continued to recognise Preston as, 'undoubtedly the best team in England', before making them favourites for the FA Cup, which they also won. Further papers discussed the 'greatness' of such a performance before The Dart, wrote that the final game of the season against Aston Villa was one of great sportsmanship, "It was possibly the best ever shown on a football field." This summer shall see the World Cup arrive in Brazil for a second time. In the modern game we take professionalism as a given, assuming it has always been there. It is important to understand the struggles of professional clubs pre-1900 in order to see the wider impact football had on the social fabrication of Britain and later on, the world. In Brazil, widespread social protests have taken place against the World Cup in two weeks, but I feel that football can bring the country together and with it provide the reforms they undoubtedly need. Preston were football's first professionals, invincibles and giants. A story which needs to be heard!